Unfortunately, there are a few knuckle-heads out there who are eager to make a buck in the knife business by any means necessary. Some might attempt to steal our precious little gems, while others may try to defraud us by selling us counterfeited knives. Most of these crooks prey on the beginner and novice collectors, but some counterfeiters are good at what they do and a can sometimes fool a veteran collector.Counterfeiting is probably the largest problem with knife collecting. Rest assured however, that it is not that big of a problem. There are usually telling signs that are obvious if you know what to look for. You can protect yourself by taking a few simple precautions. The most important thing that you can do is educate yourself about knives. Before you go off putting much money into the hobby, you should read a lot about it, talk to other collectors, and ask lots of questions. There are many great books available online. Some great reading can start right here. Visit the AAPK forums & dig right in to the vast amount of knowledge being exchanged daily. Make sure all parts match. Some counterfeits are made by taking pieces from two or more knives and turning them into one. Look to make sure that all of the metal parts have similar age marks. If you find a knife with tarnished, old looking back springs and brand new mint blades for example, you know something is not right. Make sure the tang of the knife is the same width as the back springs. Counterfeiters will often take an old knife and grind away the existing stamp and re-stamp or etch on one of more value. This trick can usually be spotted by comparing the width of the tang with the back springs. If the tang has been ground, it will be thinner than the springs. Make sure the pattern number and tang stamp match the knife you are looking at. 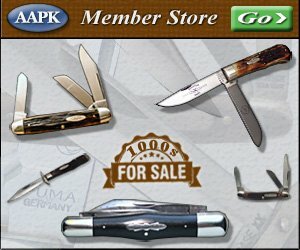 If you find a knife with a pattern number that indicates that it has bone handles, but you notice that the knife is made with genuine stag, you should stay away from it. This goes along with educating yourself about knives. Learn about pattern numbers and tang stamps from books, this website, or by talking to other collectors. If there is any doubt in your mind, get a second opinion. Ask someone you trust if there is anything that you are not certain about. We have a specific section at our knife forums just for this purpose.